The watermelon is a fruit of African origin related to cucumbers and squash. The watermelon is mostly 92%% water with around 8%% sugar and around 15%% of our daily need of vitamin C (for a 100 g portion). It has a thick, hard green rind, and a sweet pulpy red center. Watermelon is a super food that everyone should eat. The watermelon fruit, loosely considered a type of melon (although not in the genus Cucumis), has a smooth exterior rind (green, yellow and sometimes white) and a juicy, sweet interior flesh (usually pink, but sometimes orange, yellow, red and sometimes green if not ripe). Choosing: When choosing which watermelon to buy, pick one with a symmetrical and round shape. Inspect the watermelon and make sure it is free of bruises and discoloration. These could indicate that the fruit has been dropped or damaged. Make sure that the watermelon is firm to the touch because if it has soft spots, then it may be overripe already or is turning bad. The ideal color of a ripe watermelon is medium to light green. At the bottom of the watermelon, there should be a ring-like mark. It should be colored yellow, which means the watermelon was already ripe when it was picked from the ground. If the mark is colored green or white, then the watermelon was picked from the ground before it had ripened. Do not buy watermelons with rings like that. 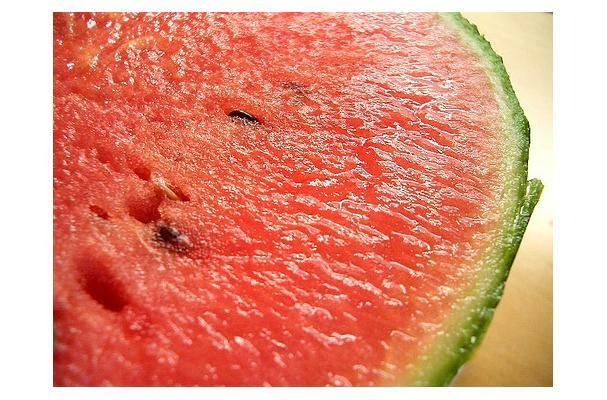 Take note that unlike other fruits, watermelons do not continue the ripening process once they have been picked. Choose a watermelon that is heavy for its size. Watermelons are composed mostly of water, so if the watermelon is light, then it is probably not as juicy and fresh as it should be, as the water content is not sufficient. Buying: If you are buying pre-cut watermelon pieces, then choose those which seem to have firm meat. These pieces should be put into the refrigerator to preserve their freshness.